Find the nest on the low flung branch of the willow tree and you have found the cradle that boards the birds....A woolie charm pack reminiscent of the "cradle" and the "birds'. Combining a pale sandy brown herringbone wool with a unique and gorgeous chevron patterned wool with shades of dusty brown and primitive blue-gray....One of Nutmeg Hare's favorite wools. As always, soaked in a wonderfully scented Eucalan bath and dried to fluffy softness, this wool bundle includes two coordinating pieces in choice of either long sixteenth (approx. 6" x 17"ea.) or fat eight (approx. 12" x 17" ea.) sizes. 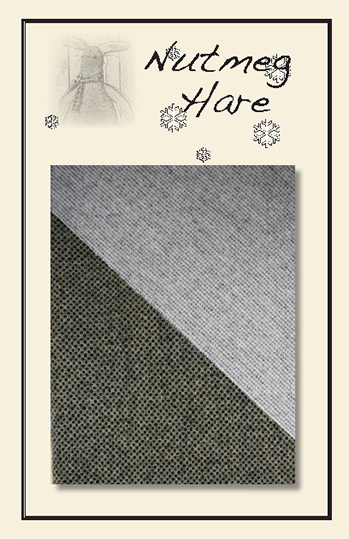 The conservative yet perfect gray plaid wool pairs with the crazy for squares wool for a bundle both unique and alluring...Lots of shades of gray all in one wool! As always, soaked in a wonderfully scented Eucalan bath and dried to fluffy softness, this wool bundle includes two coordinating pieces in choice of either long sixteenth (approx. 6" x 17"ea.) or fat eight (approx. 12" x 17" ea.) sizes. Autumn and her brilliant gown of crimson, orange, gold, and brown...She dances through the season! 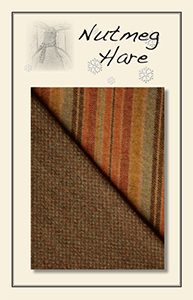 Nutmeg Hare had paired a spectacular striped wool of Autumn glory with a beautiful diamond shaped basket weave wool of golden brown and more rich Autumn shades. As always, soaked in a wonderfully scented Eucalan bath and dried to fluffy softness, this wool bundle includes two coordinating pieces in choice of either sixteenth size (approx. 6" x 17"ea.) or fat eight (approx. 12" x 17" ea.) size. With lumps of only part burned coal, the task is clear to glean the whole! Luckily, "The Coal Picker" woolen is here as a whole. Enjoy this bundle of rich black with dark gray blocks almost joined to make stripes...but not quite, paired with a raised textured black with cream threading woole...Lovely indeed! As always, soaked in a wonderfully scented Eucalan bath and dried to fluffy softness, this wool bundle includes two coordinating pieces in choice of either sixteenth size (approx. 6" x 17"ea.) or fat eight (approx. 12" x 17" ea.) size. Underwood, Royal, Remington...the vintage typewriter may have gathered some dust in the attic, but lets blow the dust off and refurbish it in the form of a beautiful wool bundle. 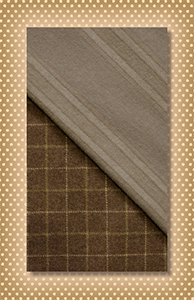 There is charm in that vintage typewriter with its sluggish keys, just as there is charm in "The Vintage Typewriter" woolen bundle. 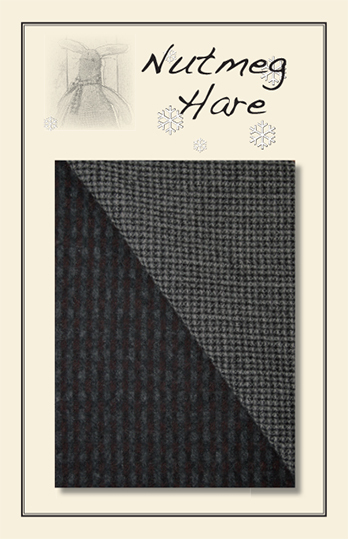 A lovely twosome of honeycomb black and creme, paired with a textured woolen of creme with dark charcoal thread weave. As always, soaked in a wonderfully scented Eucalan bath and dried to fluffy softness, this wool bundle includes two coordinating pieces in choice of either sixteenth size (approx. 6" x 17"ea.) or fat eight (approx. 12" x 17" ea.) size. 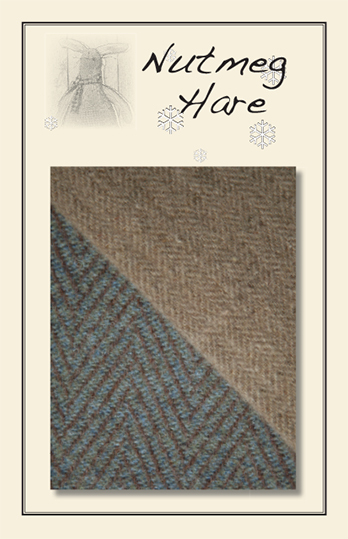 Just "A Little Brown Cottage" with a porch nodding welcome.... A door opens wide and alas you step into wool heaven. "A Little Brown Cottage" woolen bundle combines a windowpane patterned wool of grayish-brown with thin creme stripes paired with one of my favorite wools ...lighter tones with a herringone woven stripes. So many possiblities with this bundle As always, soaked in a wonderfully scented Eucalan bath and dried to fluffy softness, this wool bundle includes two coordinating pieces in choice of either fat sixteenth (approx. 6" x 17"ea.) or fat eight (approx. 12" x 17" ea.) sizes.